Bentley's placements in today's junior dairy shows followed yesterday's accomplishments quite methodically. Once again, Vanilla won the prize as the Ayrshire Junior Grand Champion. 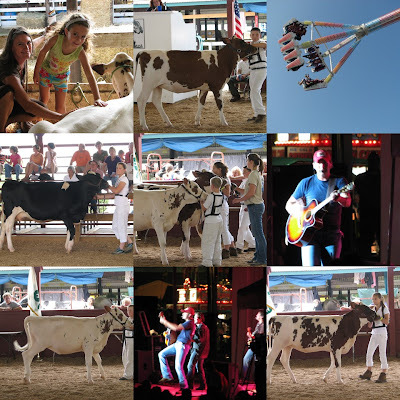 The cow beauty pageants are now completed for the summer season. Luke added a couple of nice quotes to an article appearing in today's Daily Freeman. Tomorrow commences with the slightly more stressful showmanship competitions. Friday of fair week tends to bring the most visitors by the Bentley station. It was especially fun for me to see my old organic chemistry professor and her goddaughter (pictured "petting" the cow). Rides in the midway were requested by and obtained for the younger Angell children and Rebecca and Caleb, with no fears, ventured on some rides with high rotational velocity. Rodney Atkins performed twice in the grandstands today. I felt as though I definitely entered into the "country" part of the concert when I took a seat on a big pile of dirt just to see the stage. His best song, by far, in my humble opinion, is Watching You.